I have been cooking, I promise! But nothing terribly exciting – lots of grilling, lots of stir-frying. But I’m changing all that! I want to make exciting food! Food that is beautiful, comforting, delicious…food that feeds the body and the soul. Okay, that was both cheesy and overdramatic, but I’m okay with it. My Basket of Life Farm CSA has been absolutely amazing this year. They’ve started an “add-on” program, where in addition to the standard CSA box, you can go online and purchase additional items each week. So far, I’ve gotten some awesome cherry jam and yummy peaches. I’m looking forward to the coffee, granola and other goodies! I am still working through a large amount of zucchini, however. And I’ve been craving comfort food lately – pasta, bread, soups…fall foods! Even though it’s August, in Northeast Ohio it’s definitely been feeling like autumn. 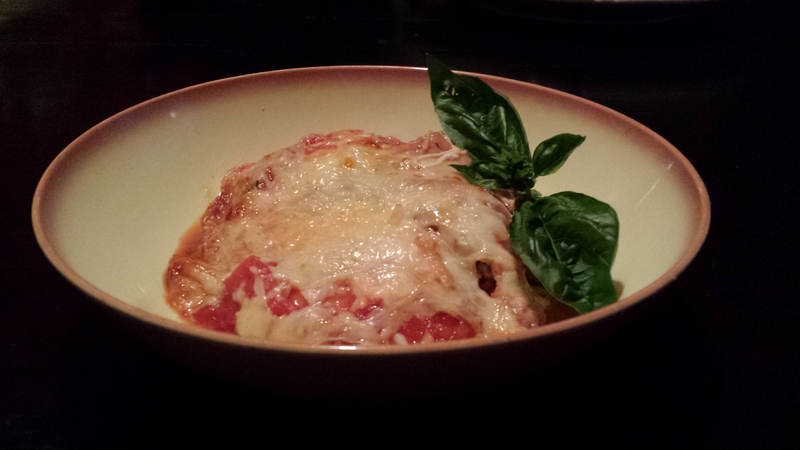 So tonight I indulged in some comfort food – a cheesy, wonderful Zucchini Parmigiana. I based it on Alex Guarnaschelli’s Eggplant Parmesan recipe, but used baked breaded zucchini instead of fried eggplant. 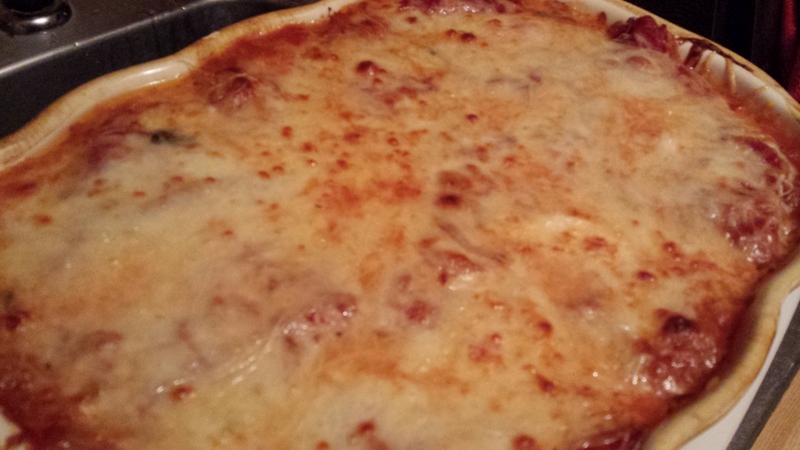 I love the tomato sauce in this recipe, and it has a ton of cheese. Fantastic! 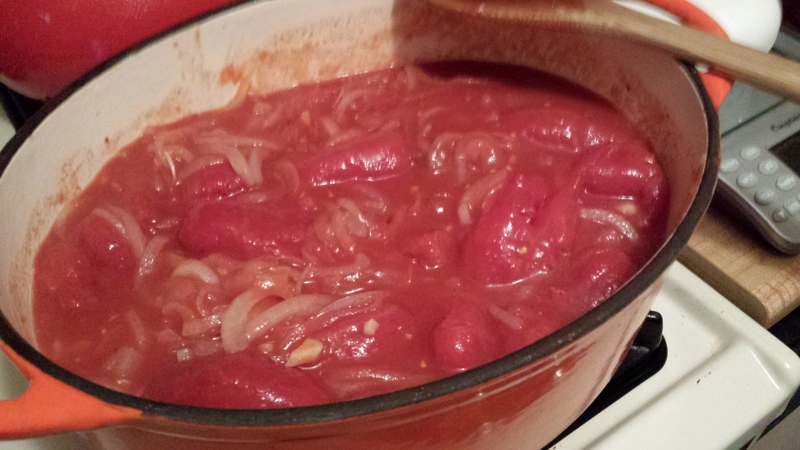 For the tomato sauce, I took three candy onions (from my CSA) and thinly sliced them. 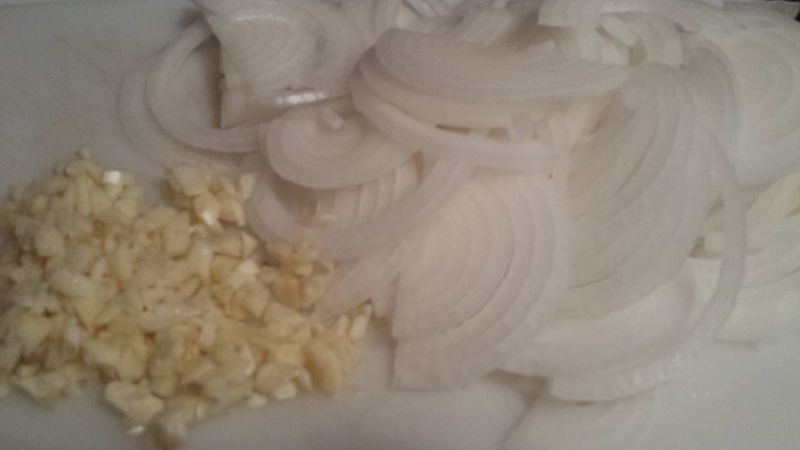 I minced 7-8 cloves of garlic and sautéed the garlic and onions together in some olive oil. 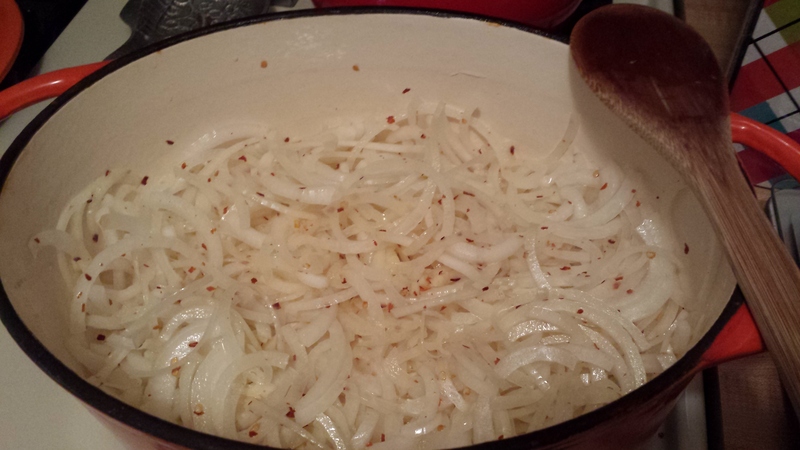 I added salt and crushed red pepper and cooked them over medium heat until the onions were soft and translucent. I added three 28 ounce cans of whole peeled San Marzano tomatoes and a little sugar and cooked the whole thing for about 20-25 minutes. As it cooked, I smushed the tomatoes and just mixed it all together. I turned off the sauce and let it cool down a bit while I made the breaded zucchini. I basically followed this recipe for the zucchini, except I used panko bread crumbs (it’s what I had on hand). I used three medium zucchinis, but it would also be good with yellow or patty pan squash – or of course, eggplants! I layered the sauce, zucchini, fresh basil, mozzarella, provolone, and parmesan cheeses until I ran out of zucchini and room in the casserole dish – ending, of course, with cheese! Now I only have one problem. I ate a huge piece of it, and you can’t even tell! I hope I can talk my sister into taking some leftovers, or I’ll be eating it for a week. That’s not bad, don’t get me wrong! But I still have zucchini, squash, tomatoes, apples, peppers and lettuce from my newest CSA box to use! FYI – I got this bowl for $.50 at the flea market! Now, off to catch up on my blog reading. So happy it’s the weekend! 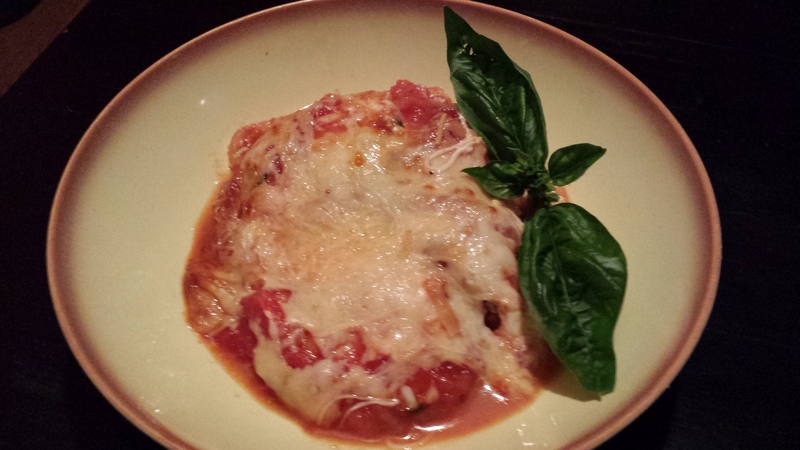 This entry was posted in CSA, Dinner, General, Recipe and tagged comfort food, dinner, garlic, onions, tomato sauce, zucchini on August 2, 2013 by Melissa. Looks yummy. Nice bowl too. It looks delicious–great idea to sub in zucchini for the eggplant. I’ve got the opposite problem here, plenty of eggplant, but lots of green tomatoes that I just know will turn red so I can use them for sauce. But until then . . .